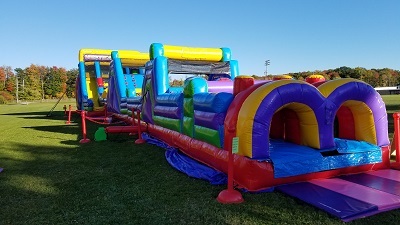 This Mega Obstacle Course lays out at 100 feet long with a 7 element obstacle course to start and then into the crawl tubes up the climb wall and down the slide leading to another set of crawl tubes and then up the Vertical Rush climbing wall and super steep finish on the slide. 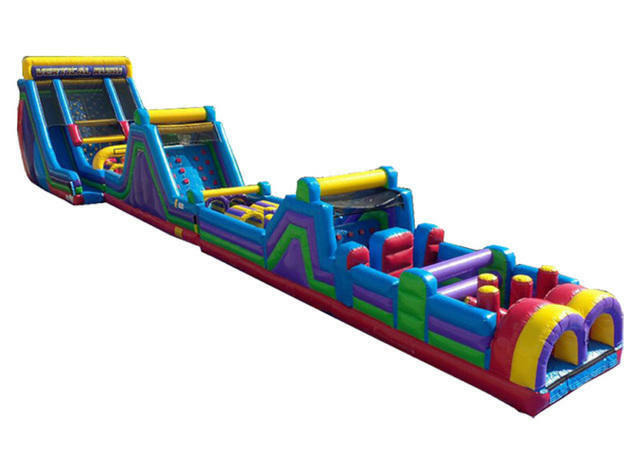 This one is sure to be a challenge for kids and adults alike, so rent the ultimate obstacle course for you next big back yard party or coporate party or event . This complete course comes with 2 generators and fuel for the day. It takes 5 seperate 20 amp circuts to run so we include the generators that will cover all 5 outlets for the day.